Another patch, another slew of changes—and with Worlds coming up soon (just two patches and a September away), this one's a big'un. The introduction of so many new items and balance tweaks in the last few months have been alarming to pro players and team analysts, as they force a frantic pace of adaptations in preparation for the big prize... and, conceivably, have affected some tournament results along the way. It's not just a change in top-tier champions that affects tournament outcomes, but general role dynamics too. Across-board nerfs for aggressive jungle champions, for instance, was a major factor in the top-lane teleport metagame that rewarded teams oriented towards particularly capable carry laners in that role, favoring them over more supportively oriented player styles. The effects of it wouldn't be immediately apparent to the casual viewer: in both meta instances, Maokai's a high priority pick due to his inherent strength in teamfights. But the difference is between a Maokai that teleports early to rush people down with Righteous Glory and a Maokai content to sit back and farm for 30 minutes before stomping into the fray with a more expensive overall kit to include Frozen Heart, Aegis of the Legion, and whatever else is specifically handy for the overall game situation. Unfortunately, I've got some terrible news for carries: 5.16 does you no favors. Initially, the reduced effectiveness of armor items seemed like it would be a boon to AD carries. Even if they're cheaper, they offer less points of armor per item—surely a substantial improvement for the role. And given how much AD carries have struggled this year, it certainly seems overdue. But look closer. It's like an unbelievably good cell phone deal: the stipulations to their "buff" come at greater cost than any of its benefits. The armor decrease comes hand-in-hand with an across-board armor-per-level gain buff, especially to bot-lane supports like Alistar and Leona. What was already an increasingly difficult laning phase, far more dependent on the support's influence than anything the AD carry does, is made even harder as a result. Early on, nobody buys cloth armor or anything similar, so the item reductions don't affect that crucial early phase at all. But it gets worse! With Randuin's Omen now neutralizing a percent of critical hit damage, physical damage carries now have an even rougher transition out of the laning phase too. Their long-term game plan, as of the last season, was to build up serious AD and back it up with serious critical hit modifiers from Infinity Edge—a combination of damage amplification effects more than capable of burning down even the most stubborn of tanks. With the crit nerf, however, even their late-game presence is now in jeopardy. A combination of Frozen Heart and Randuin's Omen hurts especially badly now. If you think this means that Corki gets yet another indirect pre-Worlds buff, don't kid yourself. They dropped the cost of magic resistance items too—not necessarily a hard nerf to mages, who got a lot of goodies with the AP itemization update patch, but champions reliant on mixed damage kits to circumvent armor stacking now has an even smaller window of relevance to play with. On the other end of things, bruisers got their Christmas presents early! The new items are meant to help the "juggernaut" archetype—the sort of champion that's meant to wade into a fight into punching range and break noses. ...they might've done too good a job at it. The new items are a little crazy. Expect a lot more Hecarims on patch 5.16, because the horsey got a better saddle. Dead Man's Plate, fresh out of Black Market Brawlers, turns an already quick pony into a devastating charger: Dreadnought passive boosts to his movement already plays into a kit built around running around, but then further rewards Hecarim for just plain existing by adding extra damage and a slow for hitting people at full speed. 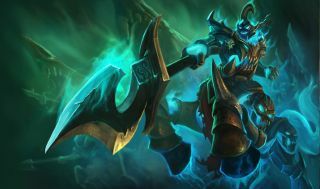 The item might be named after Gangplank's recent lore escapades, but it is effectively a multiplier on Devastating Charge, not to mention giving the champion an even larger radius of engagement to work with. Meanwhile, there's Sterak's Gage—or, as I'd like to think of it, Mega-Gnar's Favorite Toy. Not only does it give Gnar a great early-game itemization path (Long Sword and Giant's Belt? Perfect! ), but it's exactly the sort of item he'd want for jumping into teamfights: a giant chunk of free attack damage, a health-scaling shield, and an even BIGGER physical size! All the better to absorb skillshots with and intimidate smaller champions! Unfortunately, and ironically, signature bruiser item Warmog's Armor loses relevance in the face of all of this competition. There's only six slots, after all, and so many things build off Giant's Belt now. Even as Warmog's Armor basically gets Garen's passive, regenerating a crazy 3% total HP per second if you haven't been attacked in a while, its steeper cost and mitigated combat relevance makes it a difficult choice in light of these better options. The situational regeneration's only really useful for sustained laning presence—it doesn't exist at all in context of a team fight, or if you're under 3000 maximum health. Even a Frozen Mallet's more useful. Of course, that raises the question for how the meta's going to adjust to this bruiser-biased metagame. The meatier metagame and crit mitigation demands a greater focus on percent-health damage sources. The reduced value to Infinity Edge is an indirect buff to Blade of the Ruined King, as well as champions that can exploit it to max potential. Generally, that takes two forms: either auto-attackers already equipped with percent-health damage, or champions that are inherently hard to catch and can kite forever. In other words, welcome back to the meta, Vayne and Caitlyn. Vayne's the high-risk/high-reward type: relatively short auto-attack ranges and a very short-range dash. She's slipperier than eels, but can't quite make it over walls, making her comparatively easy to catch (if you can dodge or bait out the Condemn knockback, at least). But the inherent synergy of Silver Bolts and Ruined King makes quick work of even the meatiest tanks, and is one of the few AD carry kits that truly benefits from the armor changes. Kog'maw too, for similar reasons, except exchanging short-range mobility for ungodly range. He might not have escapes, but who needs escapes if the rest of your team's made of bruisers too, making it nigh-impossible to catch him? Caitlyn, however, has none of their benefits—the reason you'd play her's simply for an easy laning phase and to be impossible to catch. The Sheriff of Piltover's 90 Caliber Net flings her backwards, over walls and out to safety, and the Yordle Snap Traps make it difficult to path straight at her. Anything, in other words, to squeeze out yet another autoattack. Ruined King won't let her kill anywhere near as consistently or quickly as the Infinity Edge meta, but that isn't her role—in fact, that isn't the role for any AD carry anymore. To the chagrin of bot lane specialists, it's a misnomer to consider them carries now. The more accurate mindset, I think, is to count them as sustained-damage supports. There is the faint and desperate hope, of course, that patches 5.17 and 5.18 provides them some love. But for the next month, at least, things are going to be a little (more) rough for the League's gunslingers.